Aymara Marchante (from left) and Wiktor Garcia talked with Maria Elena Santa Coloma, an insurance adviser with UniVista Insurance, during February 2015 sign-ups for health plans in Miami, Fla. Ten million people still don't have health insurance two years after the Affordable Care Act went into effect. Some never bought a policy. But 20 percent went to the trouble of signing up on HealthCare.gov, or one of the state insurance exchanges, and even made payments. Then, those 2 million people let their insurance lapse. NPR asked visitors to our Facebook page to tell us why. Many, like Laura Patterson, dropped their coverage when they got good news on the job front. "I was a seminary student working part time at a church and I needed health insurance," she says. "I enrolled for the first half of the year in a plan that I knew, even if I just had a fairly minor accident, I wouldn't be able to pay all the bills. When I graduated from seminary and got a full-time job as a pastor, I had really great coverage through my church, so I dropped my ACA plan." 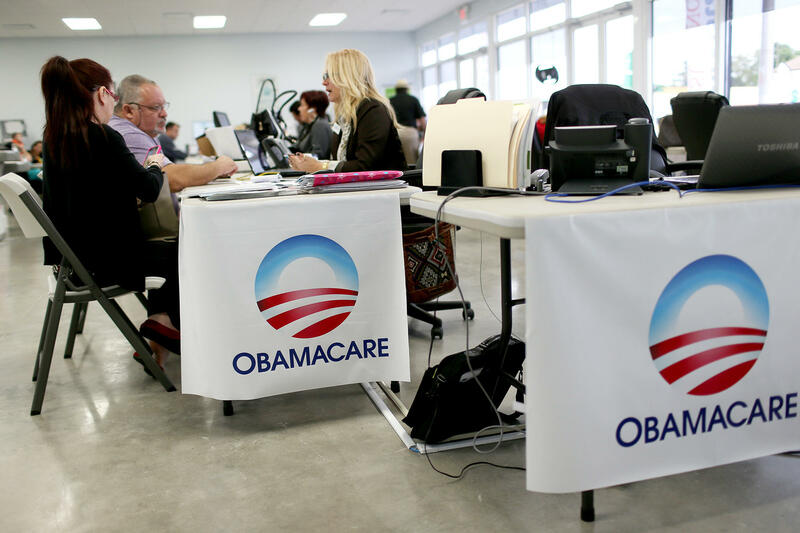 Others say they dropped their Obamacare health coverage because they found the plans too confusing, too expensive or not worth it. Brendan Skwire tells NPR his insurance was too pricey. "Basically, my premiums doubled when my income imploded," he says. "I simply couldn't afford to pay the bill." Several people say they were dropped from their health plan's rolls without warning. Elaine Marie was one of many who tell us they never knew their insurers were seeking more information from them. "I was dropped from my plan last year for 'not providing additional income information,' " Marie says. "I check my mail regularly, and did not receive notice in the mail, or via email, or through the secure exchange system email." Meanwhile, Vic Higgs of New York says the premiums and copays required in her current Obamacare plan are too expensive, relative to the small amount of medical care she uses each month. She plans to drop the plan in January. "I only visit two doctors a year, and only receive one monthly prescription that — prior to having insurance — cost me 80 bucks a month," Higgs writes. "I think paying directly for the doctor visits and prescriptions is cheaper right now than having insurance." As open enrollment begins this Sunday, these are some of the people Uncle Sam is going to try to re-enlist in the health care exchanges. In the two years since the Affordable Care Act went into effect, most people eligible who actually wanted health insurance and could afford it have been enrolled. The remaining patients who lack insurance will be harder to lure — and harder to keep, says Sylvia Burwell, secretary of the department of health and human services. Burwell says people in this group tend to be young, and live barely above the poverty line. About a third are members of minority groups, and most are men. "The remaining uninsured just get harder and harder to reach," says Larry Levitt, a health reform and insurance markets analyst at the Kaiser Family Foundation. There's little information showing where people go when they leave the exchanges. A study of the California market found only 15 percent quit and remained uninsured. Levitt says the national figures are probably about the same. So what's the government to do? HHS is trying a variety of strategies. The agency plans to use email, text messages, Facebook and online ads to convince the holdouts to get insurance. It's also launching some new Web tools that will allow people to compare health plans more easily and estimate their cost. A new app lets consumers input details of their medical needs, including the names of doctors and medications, to find appropriate plans. The app also allows them to estimate how many visits they expect to have, and prescriptions they expect to use, as well as estimate how much they're going to spend out of pocket, beyond of their monthly premiums. And for the first time, HHS will talk about penalties. People who don't buy a policy of some sort will face a $695 charge per adult at tax time next year. The agency will get lots of help from private groups in enrolling patients this year. For example, the nonprofit group Enroll America has staff in 14 states and works with community organizations across the country. "We do a lot of work with faith leaders across the country," says Anne Filipic, the group's president. "We work with community colleges and small business owners. We work with restaurant associations and taxi cab associations. Perhaps we'll go to church on Sunday, and we'll actually stand up in front of the congregation and share with them the information." Enroll America will be offering its own Web app to help with the comparison of health plans. The hope is that extra clarity will reduce unexpected costs and help keep people like Dave Egbert and his partner Rich Davis motivated to get insured and stay that way. Egbert, of Huron, S.D., also contacted NPR via Facebook. He says he and Davis each dropped their coverage because the fees for doctor visits and tests added up unexpectedly. They could pay the premiums, Egbert says, but the overall costs were too much. "I couldn't afford to actually use the health insurance," he says. Millions of Americans have found the Affordable Care Act to be unaffordable. We have numbers this morning on people who have checked out of the law called Obamacare. The law was meant to hold down health care costs and encourage almost everybody to get health insurance. And to be clear, people have been signing up. The rate of people uninsured in this country has been improving. But millions of people still lack insurance, even though they're eligible to buy it. And NPR's Alison Kodjak reports that millions more who did sign up last year have quit carrying insurance. ALISON KODJAK, BYLINE: Two million people, that's how many signed up for health insurance through Obamacare last year and then dropped it. There are lots of reasons. Some got insurance through a job. Others turned 65 and qualified for Medicare. Others like Dave Egbert, a bus driver in Huron, S.D., just didn't think it was worth it. DAVE EGBERT: The point of having insurance is that you should be able to go to the doctor when you need to and not be worried about the bills. KODJAK: Egbert let his insurance lapse when he moved to South Dakota last year because the premiums for the few plans offered in his area were too high. His partner, Rich Davis, works at a bowling alley. He only bought insurance after going to the hospital with chest pains earlier this year. Egbert remembers that day. EGBERT: Well, by the time he got home, he was feeling dizzy, and they said, oh, we think you're having a heart attack, and they basically rushed him to the hospital. At first, they thought he was just going to die. KODJAK: Hospital officials helped Davis sign up for insurance through Obamacare. But six months later, he dropped that policy, too. Egbert says the copays for doctor visits and the additional fees for tests were more than the couple could handle. EGBERT: You know, if you don't know how much you're going to end up paying at the end of the month, it's really, really scary. You know, it's still way too expensive. KODJAK: Egbert and Davis are among those who bought policies through the exchanges and then dropped out before the year ended. Now government officials want to convince them that insurance is worth the cost. Larry Levitt studies health reform and insurance markets for the Kaiser Family Foundation. LARRY LEVITT: Some of the hardest groups to reach now are lower middle income people who, you know, still struggle with the cost of insurance but aren't getting subsidies that are quite as large. KODJAK: Levitt says most of those who leave the exchanges find insurance elsewhere. About 15 percent quit altogether because it's too expensive or because their insurance doesn't pay for enough of their medical costs. LEVITT: If that number starts to grow, I think it would start to be a cause for concern that maybe the subsidies are inadequate, and insurance just isn't affordable enough for people. KODJAK: The Department of Health and Human Services says it doesn't expect enrollment to grow this year as much as it did in the past. The agency plans to use email, text messages and web ads to convince holdouts to get insurance. And for the first time, they'll talk about penalties. People who don't buy a policy face a $695 charge at tax time next year. And the government will get lots of help from private groups. ANNE FILIPIC: We have staff on the ground in 14 states across the country and work with partners in all 50 states. KODJAK: Anne Filipic is president of Enroll America, a nonprofit group that helps people enroll in health care plans. FILIPIC: We do a lot of work with faith leaders across the country, with community colleges and small business owners. We work with restaurant associations and taxi cab associations. Perhaps we'll go to church on Sunday, and we'll actually stand up in front of the congregation and share with them the information about what's available. KODJAK: And Enroll America will have a new web app to compare health plans. The federal government is launching one, too. Filipic says the apps will allow people to enter their doctor's names and their medications and estimate cost based on how many visits and drugs they need. FILIPIC: And that is a level of transparency that has not existed in the past. KODJAK: The hope is this extra clarity will reduce unexpected costs and help keep people like Dave Egbert and Rich Davis insured through next year. Alison Kodjak, NPR News, Washington. Transcript provided by NPR, Copyright NPR.